Gatherings at Jefferson Place is a 55+ community in Ellicott City, Maryland. This active adult community offers low-maintenance condominiums available on a resale-only basis. Gatherings at Jefferson Place is made up of mid-rise buildings with elevator access. Residents enjoy access to Gatherings at Jefferson Place's community clubhouse and beautiful outdoor amenities. With less time worrying about exterior home maintenance, homeowners have more time to explore the area parks, golf courses, and attractions in Ellicott City. 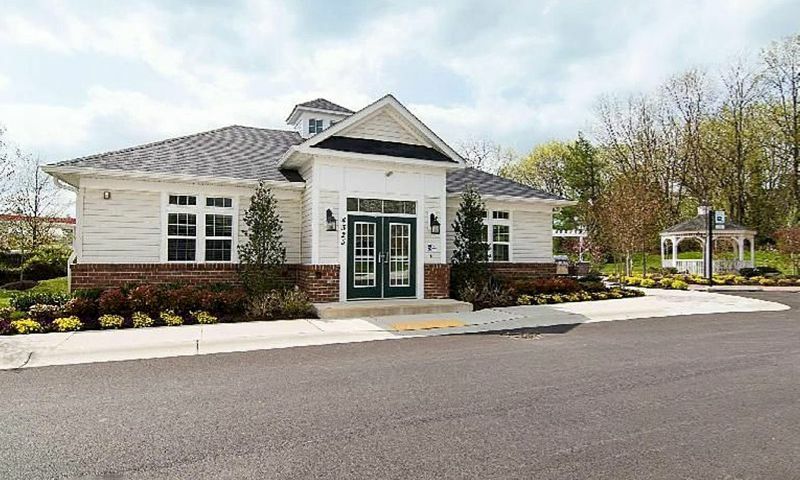 Gatherings at Jefferson Place has a charming clubhouse that's available exclusively to residents. They can utilize the many tables for community events or game nights in the multi-purpose room. The clubhouse is complete with a catering kitchen that's wonderful for neighborhood parties. Outdoors, residents have access to a beautifully landscaped patio area that's furnished with benches and a grill. The gazebo is the ideal place to enjoy a beautiful day with friends and neighbors. Beazer Homes began construction of Gatherings at Jefferson Place in 2009 and it was completed in 2012. There are 74 condo units situated in mid-rise buildings with elevator access. These low-maintenance homes were offered in four floor plans that range from 1,439 to 1,963 square feet in size. Each unit has two bedrooms and two bathrooms in an open layout. Some units offer a den that can be used as a study or extra entertaining space. Homeowners of Gatherings at Jefferson Place also have an individual one-car garage and a private patio or balcony. Homeowners never have to worry about snow removal or yard maintenance because the association covers these tedious chores. Gatherings at Jefferson Place's residents enjoy a relaxed lifestyle with more time to spend socializing with neighbors in the clubhouse or exploring all that the area has to offer. Living near fellow active adults fosters lifelong friendships with residents who share the same interests. Gatherings at Jefferson Place is located in Ellicott City, Maryland. The community enjoys a convenient location near Route 29 and I-95, making Baltimore a 20-minute drive away and Columbia just ten minutes away. Closer to home, residents have easy access to Long Gate Shopping Center and six area parks. Golf enthusiasts have many options at nearby golf courses including Waverly Woods Golf Course, Timers of Troy Golf Course, Hobbit's Glen Golf Course, and Diamond Ridge Golf Course. With so many recreational opportunities in Central Maryland, Gatherings at Jefferson Place is a wonderful condo community for those aged 55 and better. Check back soon for more information on the lifestyle in Gatherings at Jefferson Place. Beazer Homes offered four floor plans that range from 1,439 to 1,963 square feet in size. These modern condos feature a private patio or balcony with a one-car garage. All units have two bedrooms and two bathrooms. Some homes offer a den as well. 55places.com is not affiliated with the developer(s) or homeowners association of Gatherings at Jefferson Place. The information you submit is distributed to a 55places.com Partner Agent, who is a licensed real estate agent. The information regarding Gatherings at Jefferson Place has not been verified or approved by the developer or homeowners association. Please verify all information prior to purchasing. 55places.com is not responsible for any errors regarding the information displayed on this website.